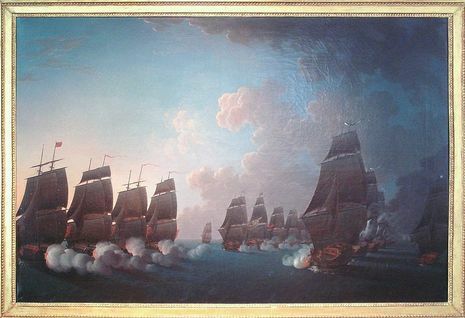 In the first meeting between them on April 17 to the leeward of Martinique, Guichen escaped disaster only through the clumsy manner in which Sir George's orders were executed by his captains. Rodney wished to concentrate on the rear of the enemy's line, but his captains scattered themselves along the French formation. Thanks to the orderly fashion in which De Guichen's subordinate squadron-commanders dealt with the crisis, especially the third-in-command Comte de Grasse's rapid closing-up of the battle-line, Guichen managed to extricate himself from a difficult situation and, instead turn a narrow defeat to a drawn battle, although his and Marquis de Bouillé's objective to attack and seize Jamaica were cancelled. During the battle, both Rodney's Sandwich and Guichen's Couronne were temporarily cut off from their respective fleets and bore the brunt of the battle. Seeing that he had to deal with a formidable opponent, Guichen acted with extreme caution, and by keeping the weather gauge afforded the British admiral no chance of bringing him to close action.